My hair has hasn't been as healthy as it's been for the last 3 weeks and I can only attribribute it to the great hair masks I've been using. One of the ones on my usage rotation is the previously reviewed Wella Professional Hydrate Mask, but I have also added another miracle hair mask into the routine so I get repairing properties into my hair as well. Love the fact that I don't' have to let this sit in my hair for a great length of time for it to work. Handy for short showers during the week when I don't' have time. 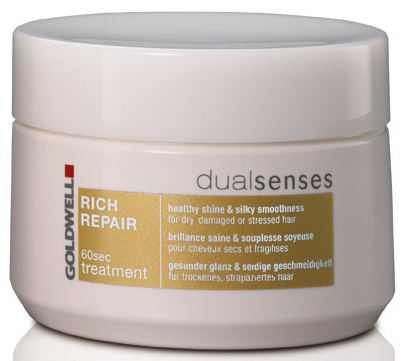 Like the other Dualsenses rich repair range, it has a sensual sandalwood scent with instant microfluid technology for quick delivery of the active ingredients. Intensively nourishes my dry and stressed hair to bring back the gloss and shine. It has also reduced the number of split ends I'm experiencing. Leaves hair soft, silky and so much more manageable and easier to style. 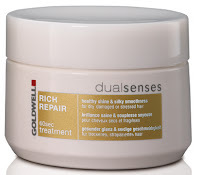 If your hair is lackluster and needing some intensive care, nothing fixes it as well or quick as hair masks and this Goldwell Dualsenses rich repair 60 sec treatment is a saviour to my locks and ends. How you use hair masks? Which have your tried and loved? RRP A$20.95 at selected hair salons.